Every once in a while, you buy a bunch of music from a band you’ve never actually heard, just because your guts tell you that this is something you’ll enjoy immensely. For me, Autarkeia is a perfect example of such a band. Having been a fan of IFB Records owner Nevin Marshall and his various musical projects (mainly Jiyuna and Merkit), I had a feeling that his next endeavor would fit me perfectly. 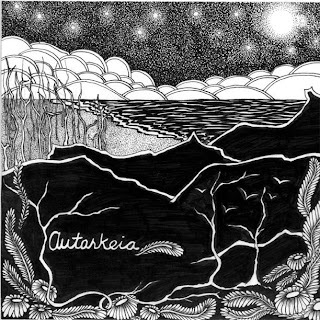 Autarkeia sounds like a forgotten band from the mid90s, taking cues from bands such as Policy of Three, Portraits of Past and Indian Summer. Clean guitars dominate the sound as a whole, with punishing drums and bass in the background. The songs usually start of down-to-mid- tempo, escalating to an emotional cascade of sound with a more distorted guitar sound to it. The vocals go from whispered and spoken to desperate screams and shrieks, underlining the personal and socio-political themes of the lyrics. The melodies are usually haunting and semi-dark, and the vocals are sometimes reminiscent of bands such as Funeral Diner with the passionate deliveries and often using vocalised melodies that are more or less in contrast of the melodies of the guitar. Sometimes, a backing vocal chimes in for added effect, and it works like a charm. This record held my attention since the first two seconds, until the end of its epic finisher Wait for Tomorrow. It’s hard for me to point out the strongest track on this album, as every single song has qualities that separate them from the rest, both on the album and in the genre as a whole. For me personally, the album’s second track, Between a Tale of Two Cities, sums up the band’s sound perfectly; clean guitar and desperate spoken vocals, gliding over to screamed words and harder guitar work, adding a rumbling and crushing bass on top of it all. The last track of the album, the already mentioned Wait for Tomorrow is the longest on here, not losing its grip on you a second of all its 7+ minutes. I’d recommend you listen to this if bands such as Ravachol and Crows-An-Wra has caught your attention; Beautiful melodies packed into that perfect mid90s inspired emo-package that I’ve loved since the first time I heard it. Support this band; this is DIY in its purest form. Also, it's available for free download on that page, so it can reach the most fans possible. If you like what you hear or you want to help the Autarkeia and IFB Records out (and let's face it, why wouldn't you! ), you can buy it in both CD and vinyl forms from IFB here http://ifbrecords.com/pages/main.html. Autarkeia aren't on social media as far as I can tell, so you can only find them on bandcamp. IFB Records blog - http://ifbrecords.blogspot.co.uk/.